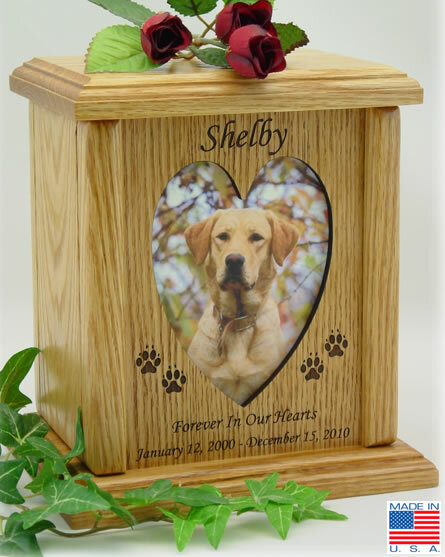 This beautiful Heart Photo Wood Pet Urn is crafted of solid Red Oak and Alder. The grain and color of these woods makes a nice background for the photo of your pet. 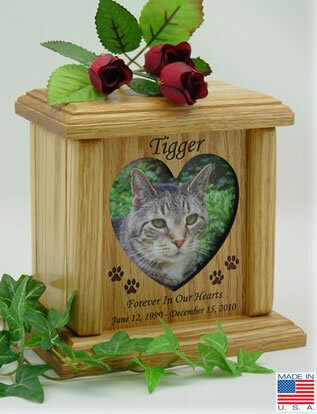 The name of your pet, optional paw prints, dates, and a short sentiment can be engraved. The engraving is included in the price of the urn. The photo placement area is protected by a piece of glass and a wood frame which can slide open with ease for your photograph placement, without the removal of the top or bottom of the urn. Photo size for the Small urn is 3.5"W x 3.5"H, photo size for the Medium urn is 3.75"W x 3.75"W, and photo size for the Large and X-Large urn is 3.75"W x 5"H.
Four brass screws attach to the bottom plate to seal the urn. Pads are placed on the bottom of the urn to protect your furniture. Dog paw prints shown with photo of dog, cat paw prints shown with photo of cat. Please limit engraving to no more than 20 characters for the name, and no more than 36-38 characters per line for Lines 2 & 3. A character is any letter, number, punctuation, or blank space. An engraving proof will be emailed to you and we must have written approval before the urn can be engraved and shipped. Please provide an accurate email address and contact phone number. Volume: 45 cubic inches - for most pets with healthy weights up to *25 lbs. Volume: - 76 cubic inches - for most pets with healthy weights up to *55 lbs. Volume: 106 cubic inches - for most pets with healthy weights up to *75 lbs. Volume: 136 cubic inches - for most pets with healthy weights up to *100 lbs. *Note: Industry standard in urn sizing is one (1) pound of healthy weight = 1.25 - 1.5 cubic inches of cremains. Please calculate weight when pet was healthy. This is a quality product created by skilled American craftsmen. Please allow approximately 3-5 business days to complete after engraving proof has been approved. Rush orders are possible but still require 2-3 business days to complete.